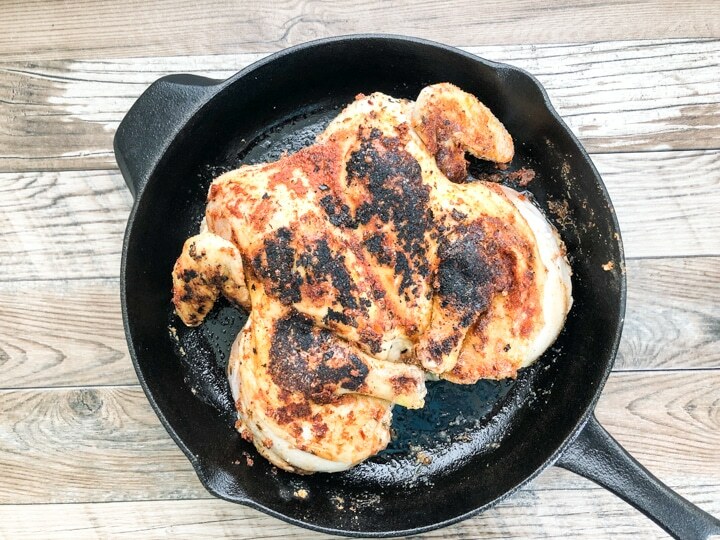 This Spatchcock Chicken Recipe with Cajun Spices is one of our favorites. 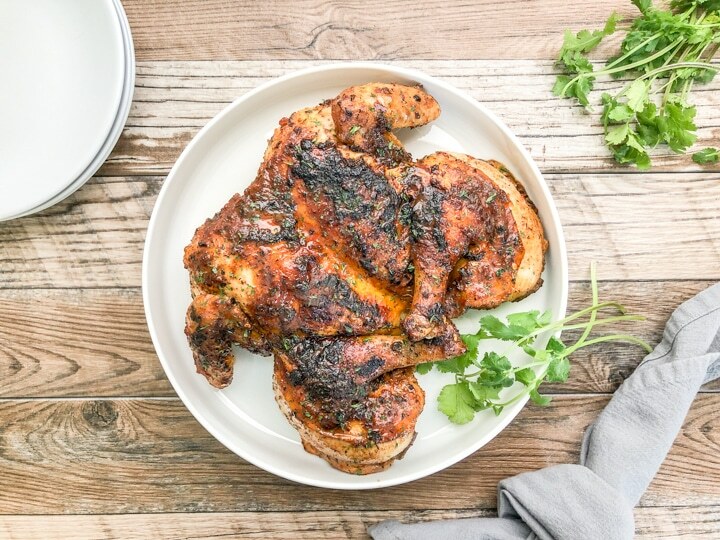 It’s perfectly seasoned with a generous amount of kosher salt and a Cajun spice blend of (garlic powder, onion powder, cayenne pepper, dried thyme) that will make this your-soon-to-be go-to chicken recipe for any day of the week. It’s simple enough to prepare for a weeknight dinner and special enough to serve as a weekend dinner. Although Spatchcock sounds like a fancy word, it really isn’t. It refers to a specific way of preparing the chicken so it cooks quicker. It simply requires that you flatten the chicken by removing the backbone of the chicken. It’s not a difficult process what-so-ever, in fact, I’ll describe in more detail below. TIP: DO NOT THROW THE BACKBONE AWAY INSTEAD PLACE IN A FREEZER BAG AND USE TO MAKE CHICKEN STOCK AT A LATER DATE. Or, you can cook over a grill for a nice BBQ flavor. For this recipe, I prefer using my cast iron skillet. Cast iron skillets always make a great sear and adds to the crusty outer coating of the chicken. 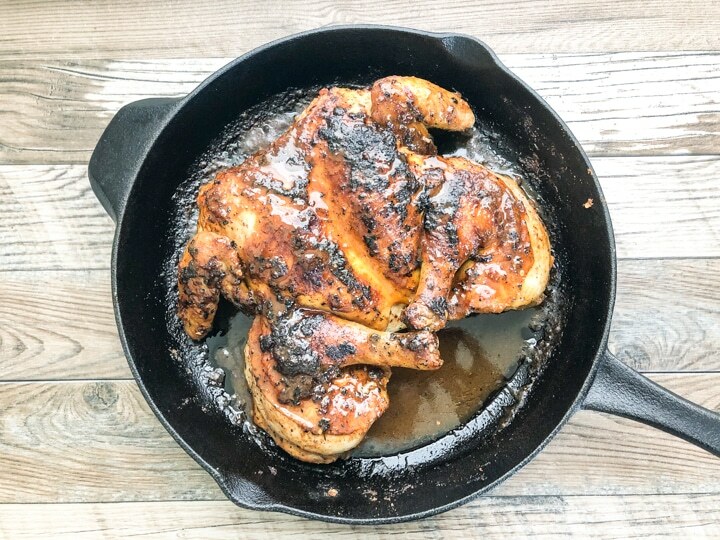 I’ve been completely obsessed with my cast iron skillets, and I think it’s the perfect vessel for roasting the best spatchcock chicken recipe. 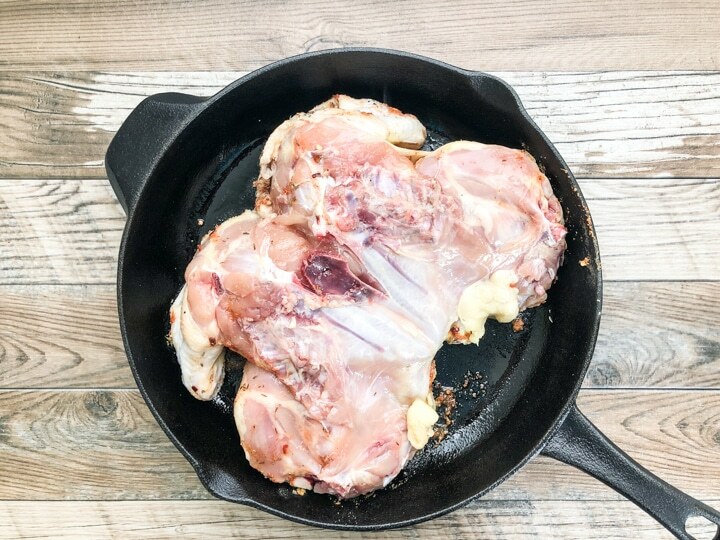 If you do not have a cast iron skillet, do not worry, this Spatchcock Chicken Recipe will be great in a simple roasting pan. 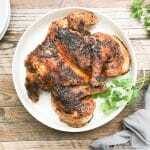 If spatchcock chicken is your thing, check out my Oven Roasted Butterflied Chicken. 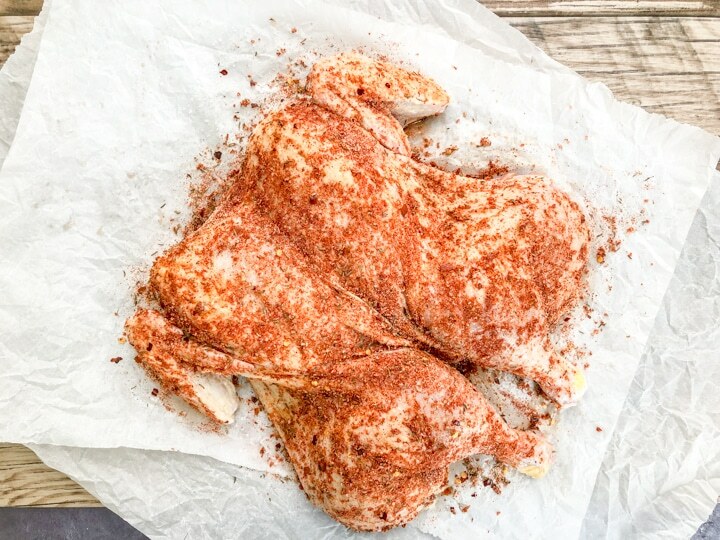 This Spatchcock Chicken Recipe is perfectly seasoned with a generous amount of kosher salt and a Cajun spice blend of (garlic powder, onion powder, cayenne pepper, dried thyme) that will make this your-soon-to-be go-to chicken recipe for any day of the week. Preheat oven to 400 degrees. Add Cajun spices to a small bowl and mix. Set aside. Remove the insides of the the whole chicken (neck, giblets, etc). Wash chicken and pat dry with paper towels. Using sharp kitchen shears, cut along the backbone on both sides and remove backbone. Using the palm of your hand, press until the chicken is flatten. Season both sides generously with kosher salt. With breast side up, season liberally with Cajun spice blend and gently press spice blend into chicken skin. Allow chicken to come to room temperature. Add grapeseed oil to cast iron skillet over medium high heat. When hot, add chicken breast side down and sear for about 8 minutes or until nice brown crust appears on surface of chicken. (Resist the urge of flipping chicken over to0 soon). Flip chicken so breast side is up. Add 1 cup of chicken broth to skillet and place in oven. Place in 400 degree oven and baste chicken with pan juices throughout cooking process. Chicken is done when thickest part of chicken reaches an internal temperature of 165 degree fahrenheit. Remove chicken from oven allow to rest. Carve and serve. Garnish with dried parsley (optional). So, do you wash your chicken or NOT? Some have recommended that you do not wash your chicken due to possible contamination or chicken juice splattering on your kitchen counter tops. Ever since I can remember, I've always washed my chicken; however, when I do I'm extra careful of not cross-contaminating. I always disinfect my kitchen sink afterwards.